The Herald Hunt is coming up next month, and for all of you that can get to it, I highly recommend going. 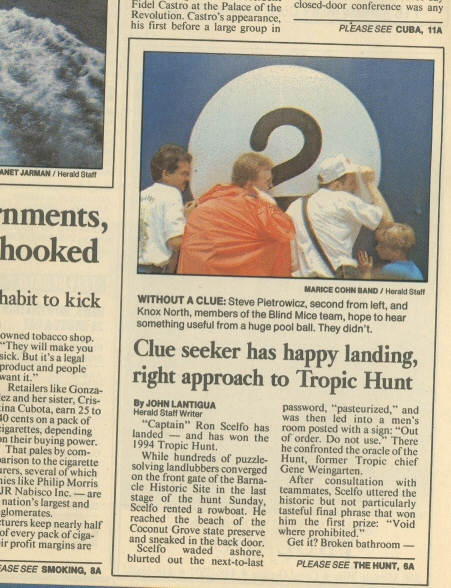 Yes, that’s me, from the 1994 Tropic Hunt. So, how did I get my picture on the front page of the Miami Herald (Dade Edition) without committing some sort of crime? Well, let me tell ya. We started off in an area where four signs were erected, each with a number and a message that said “It’s not love, it’s body heat”. The signs were at the compass points, one north, south, east and west. Dave Barry came on the radio of LOVE 94.5, and started the Tropic Hunt (that’s what it was called back then). Basically, you get a hint about where to go, and then you’re off on your own. My wife suggested that I tune the radio to 98.7, to see what we could hear. I tuned the radio headset I was wearing and listened — There was a evangalist speaking from a church. I listened a while longer and — it suddenly stopped! The next thing I heard was “Welcome to the Tropic Hunt Square Dance!” The caller on the radio said that you had to face a certain number to start, and then they started calling directions for what you had to do with the numbers. I said, “I don’t think so….” and went further away. I explained the solution to the group. Then the tall man came over again to ask my name and where I worked. I asked him what it was for, and he said that he was covering the Tropic Hunt that year for the Herald. He and a photographer followed us around for the rest of the day. Sometime during the afternoon, I asked, “So, how did you pick us?” He said that we looked like we knew what we were doing. We actually did that year… We solved all the initial puzzles in less than two hours. Unfortunately we ended up not getting the right answer for the last puzzle due to our lack of knowledge of billards. Doh! After that year, we moved away, and haven’t been to the Tropic Hunt (which has now been renamed the Herald Hunt) since. A lot of the main team from that year (The “Blind Mice”) still participate, and I’m hoping they win!